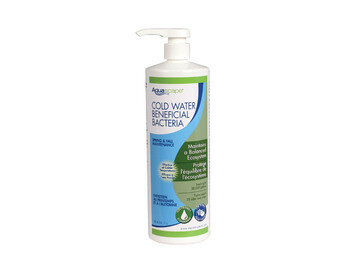 Cold Water Beneficial Bacteria/Liquid Your ornamental water garden is an enclosed ecosystem. From time to time, impurities such as fish load, uneaten fish food, decaying leaves, sludge and unwanted debris can accumulate and disrupt the delicate biological balance of your water feature. The result of this disrupted biological balance can be poor quality, foul smelling and unsightly water in your water garden. It needs help to address these issues and maintain a healthy biological balance. 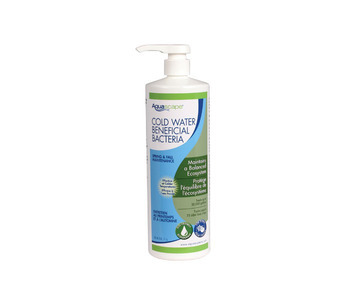 Aquascape’s Cold Water Beneficial Bacteria is just the help it needs. Its 7 pure strains of concentrated beneficial bacteria will work quickly to clean and balance the water in your ornamental pond. Aquascape’s Cold Water Beneficial Bacteria is specifically formulated with a combination of bacteria that’s very effective at doing 2 things; it works to reduce organic material and it works to reduce ammonia, nitrates and excessive nutrients such as phosphates to help maintain the biological balance of your water, reduce maintenance and help to keep your fish heathy, and ornamental water garden biologically balanced, clean and beautiful. 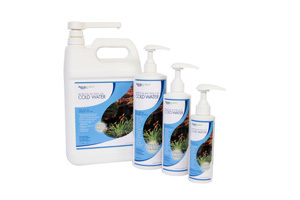 Aquascape’s Cold Water Beneficial Bacterial is available in 4 convenient sizes, 250ml/8.5 oz, 500ml/16.9 oz, 1 liter/33.8 oz, 4 liters/1 gal.